Double cellulose binding domain (dCBD) using two cellulose binding domains from Trichoderma reesei cellobiohydrolases, with an N-terminal linker and internal linker sequence between the two domains which is derived from the endogenous cellobiohydrolase linker sequence. Please see below for AutoAnnotator information about the final protein product. This part is based on the double cellulose-binding domain construct (CBDcbh2-linker-CBDcbh1) synthesised and characterised by Linder et al (1) who found that this double CBD had higher affinity for cellulose than either of the two CBDs on their own. The main difference is that our part contains an additional linker sequence on the N-terminus of the protein. 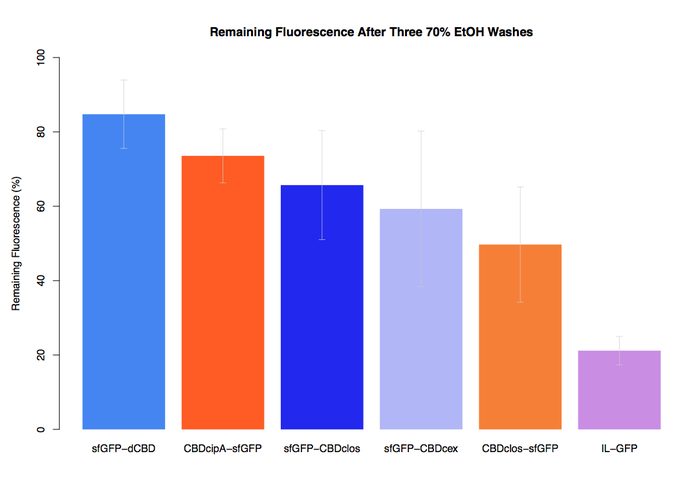 The two CBDs are from the fungus T. reesei (Hypocrea jecorina) Exocellobiohydrolase (Exoglucanase) I (cbh1), uniprot ID P62694; and Exocellobiohydrolase (Exoglucanase) II, uniprot ID P07987 (cbh2); with a linker peptide between the two CBDs and at the N-terminus of the protein. Both linkers are the same amino acid sequence and are based on the endogenous linker sequences that exists in cbh1 and cbh2 genes. The linker sequence is PGANPPGTTTTSRPATTTGSSPGP which is the same as used by Linder et al (1). The first three amino acids are from the cbh2 endogenous linker, and the rest is from the cbh1 endogenous linker. CBDcbh1 is placed C-terminal to CBDcbh2 because naturally CBDcbh1 is a C-terminal domain and CBDcbh2 is an N-terminal domain. Both CBDs are from the CBM family 1. The precise location of the CBD within the cbh genes was slightly different according to the uniprot annotations and the sequence used by Linder et al (1); we chose to use the sequence from the paper since the protein was expressed and characterised successfully. 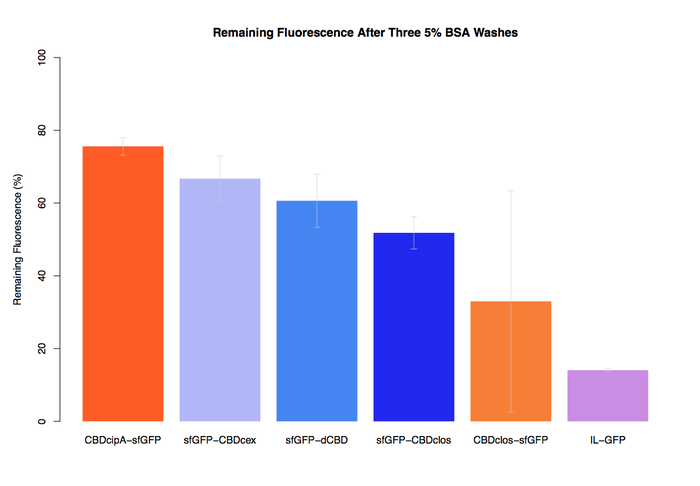 The binding ability of this CBD to bacterial cellulose was characterised when fused to sfGFP, relative to other CBDs fused to sfGFP. 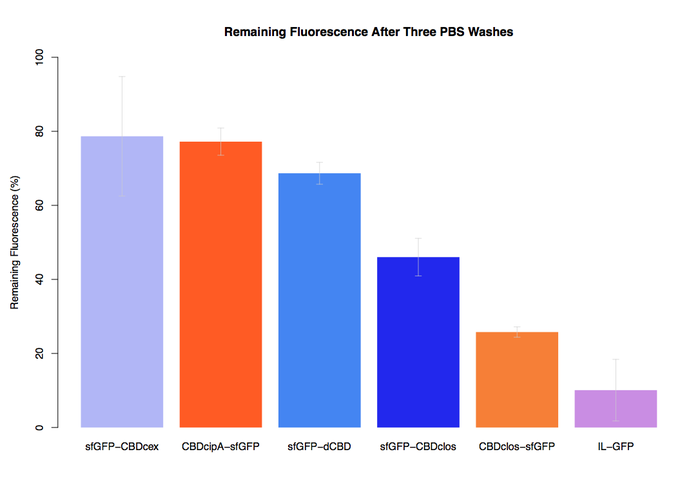 The binding ability was represented by the percentage fluorescence remaining from the sfGFP-CBD fusions bound to bacterial cellulose discs, when subjected to various washes (protocol here). 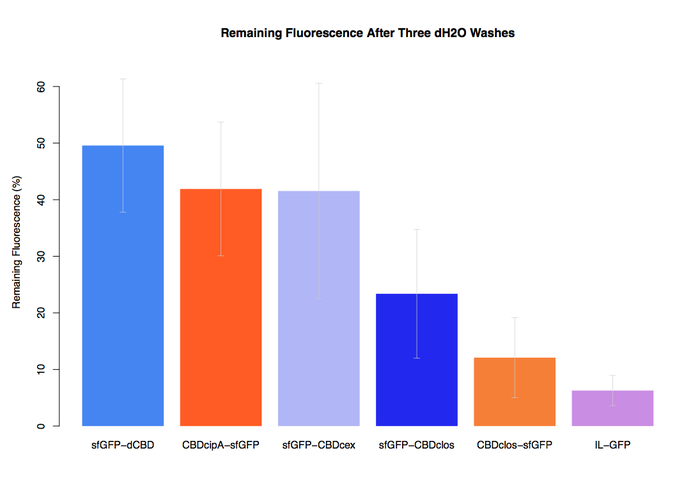 It was determined that the dCBD-sfGFP fusion had the greatest binding ability in comparison to four other CBDs fused to sfGFP after three washes with both dH2O and 70% EtOH (see first two graphs). 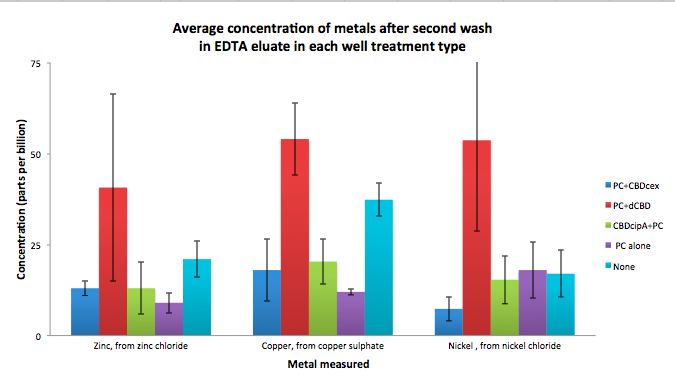 When washed with PBS and 5% BSA it had on average the third greatest ability to bind bacterial cellulose (third and fourth graphs below). 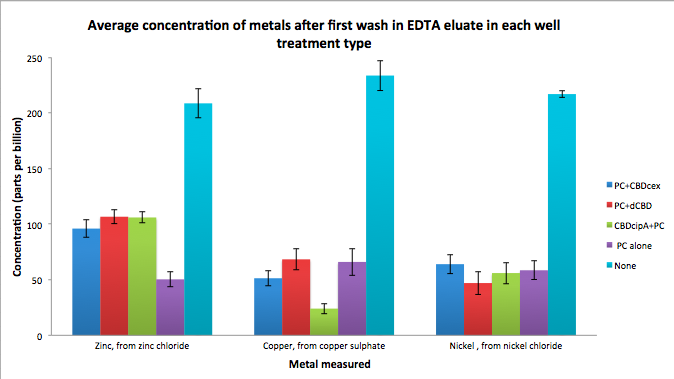 As part of our project, we needed to assay the metal binding capability of Phytochelatin (a general metal binding protein) fused to different CBDs (cellulose binding domains). 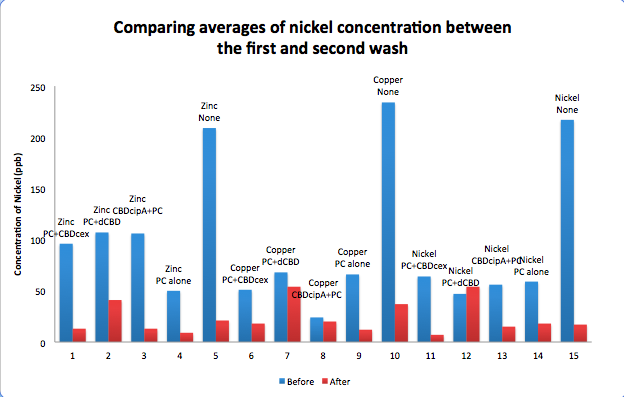 The parts used for this assay are Phytochelatin+CBDcex, Phytochelatin+dCBD, CBDcipA+Phytochelatin, Phytochelatin alone and sfGFP+dCBD wash (only one wash). There were no alignments for this protein in the data base. The BLAST search was initialized and should be ready in a few hours. There were no predictions for this protein in the data base. The prediction was initialized and should be ready in a few hours.